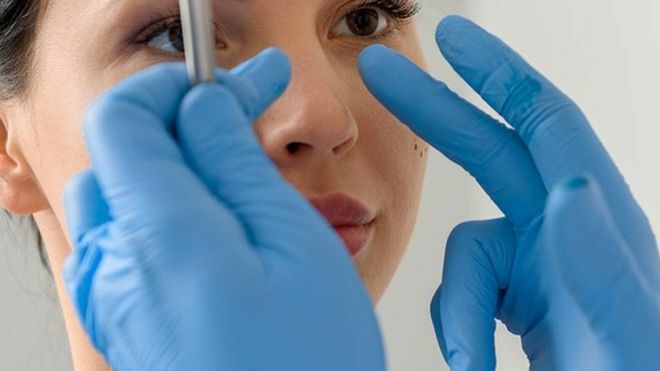 A speedy 'non-surgical' nose job that takes just minutes may be possible using tiny needles and an electric current, US researchers believe. Bendy cartilage structures - like ears and the tip of the nose - can be remodelled with electromechanical reshaping (EMR), they claim. It would be done under local anaesthetic, saving patients cuts, stitches and scars, a science conference in Florida heard. No human tests have been done yet. The researchers have tried EMR on animals. It was able to change a rabbit's ears from upright to bent. Cartilage is rubbery to the touch, but is made up of tiny strands of a protein, called collagen, linked together by other small proteins.It is flexible, yet holds its shape. EMR involves passing an electric current through the tissue (via small needles) to make the cartilage pliable for reshaping. One of the researchers, Dr Michael Hill, said: "Once the tissue is floppy you can mould it to whatever shape you want." The researchers believe that once the tissue has been reshaped and allowed to 'set' or harden for a few minutes (with the current off), the change should be permanent. Dr Hill and his colleague Prof Brian Wong, from the University of California, told the American Chemical Society meeting that EMR could be useful for treating other conditions, such as tight tendons and vision problems caused by the shape of the front of the eye (the cornea). Prof Iain Whitaker is a plastic surgeon at Swansea University Medical School and a member of the British Association of Plastic Reconstructive and Aesthetic Surgeons. He said although the work was interesting, it was much too soon to tell whether it might be something that could be offered to patients. "It's always good to look for new ways to reduce the invasiveness of surgery but it could be tricky to move this work into human trials," he said. "You'd need ethical and regulatory approval, and to know that it was safe. "If it works like the researchers hope, then I can see how it might be useful for reshaping something like prominent ears. "Noses might be a bit more limited because about a third of the nose is bone. You might be able to reshape the nasal tip perhaps." A concern is whether manipulating the cartilage might damage it. "It's not exactly clear yet how this procedure works. We don't know if the integrity will hold up and there could be a risk of adverse results," he said. Dr Hill said the procedure involves temporarily changing the acidity or pH of tissues and that it would be important to make sure this did not cause any damaging side effects before doing human trials or offering it to patients. More tests are needed. What can go wrong with a 'regular' nose job? Rhinoplasty, or nose reshaping, is an operation, done under general anaesthetic (meaning the patient is asleep), to change the shape or size of the nose. If you are getting it done for cosmetic reasons, it is unlikely that the NHS will provide it and you will have to pay (upwards of around £4,500). The surgeon may remove or rearrange the cartilage and bone in the nose and make cuts to the covering skin (open rhinoplasty) or inside the nostrils (closed rhinoplasty).